What is being a Norwex Independent Sales Consultant all about? Why try Norwex? Is it as good as you have heard? Can it really give you freedom in your work? Do you actually make a commission off your first sale? Can you control how much or how little you work? Is it possible to make a decent income with a home-based business? If you are wondering about becoming a Norwex Independent Sales Consultant and are passionate about teaching others how to live healthier lives by removing chemicals from their homes and replacing them with superior, non-toxic, eco-friendly cleaning and personal products…. watch this video and then keep reading. 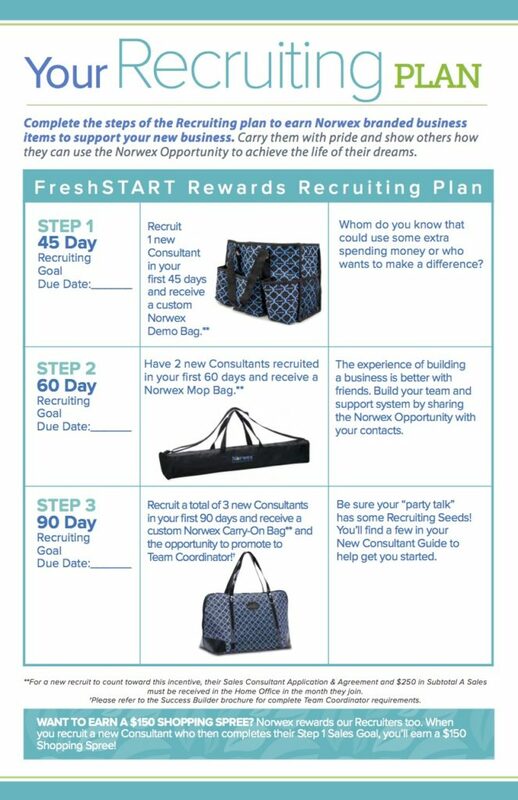 Norwex has fabulous sign up programs for new consultants that I would like to explain to you. The first is the opportunity to receive the Party Starter Kit. 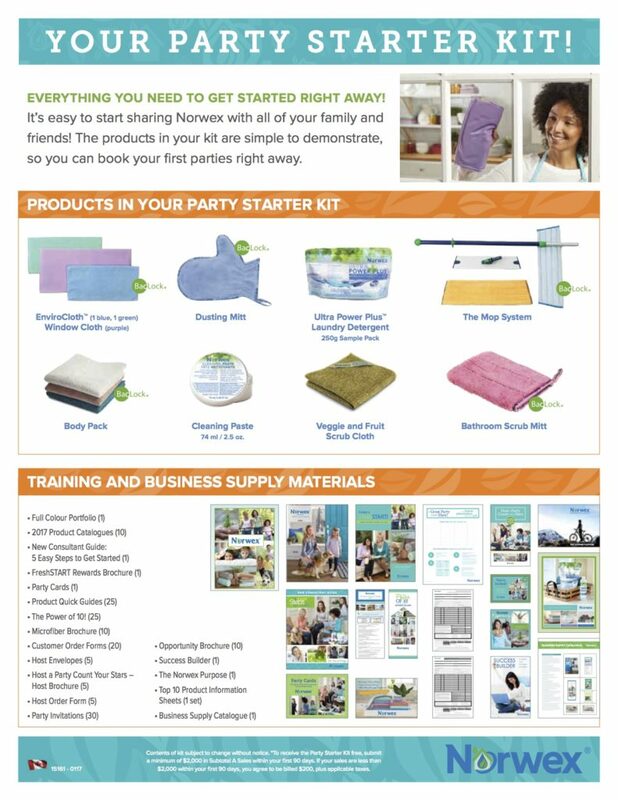 This kit is full of top-selling products that you can take with you to your launch party and demonstrate to friends and family as well as all the business supplies you will need to get started. Direct Sales works when you can let your customers try out the product and see it in action. I believe Norwex products are innovative and when people see how amazing they work, they are sold. At one party, I was able to convince a customer that the Norwex Mop System was worth buying only after I cleaned her floor with my demo mop. She had used her favourite mop to clean, before the party, but the Norwex Mop cleaned what was left behind… only using water. The Party Starter Kit is available for new consultants for FREE! To receive it for Free, you do sign a contract committing to sell $2000 (retail value) in your first 90 days of business. This is an attainable goal…the average party sells $500, in fact, its your first business goal. As a Norwex Independent Sales Consultant, you immediately earn 35% commission on your first sale! When you sell $2,ooo of product, you will earn $700 in commission! 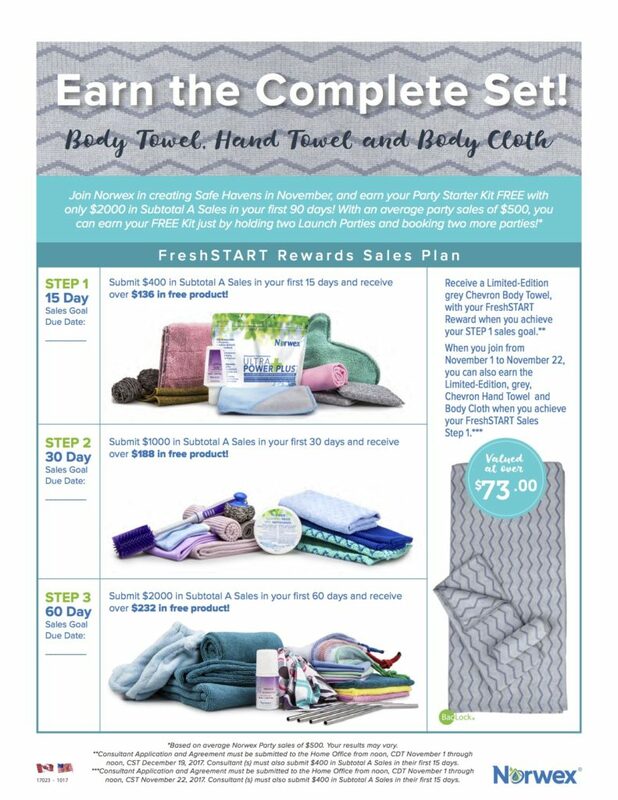 If you choose to sell $2,000 in 60 days, Norwex will give you over $560 in free product from the FreshStart Program plus a luxurious bonus this month (more information below)! The Party Starter Kit has more than $300 worth of product! If your business has a slower start and you don’t sell $2,000 in your first 90 days, the kit will only cost you $200. Check out how quickly you can earn that $200. Sell product to your friends and family (anywhere across the country)… on Facebook, a live party, by passing out catalogs, or texting your Norwex link. When you sell $600 in product you will earn $210 (with your 35% commission)!! 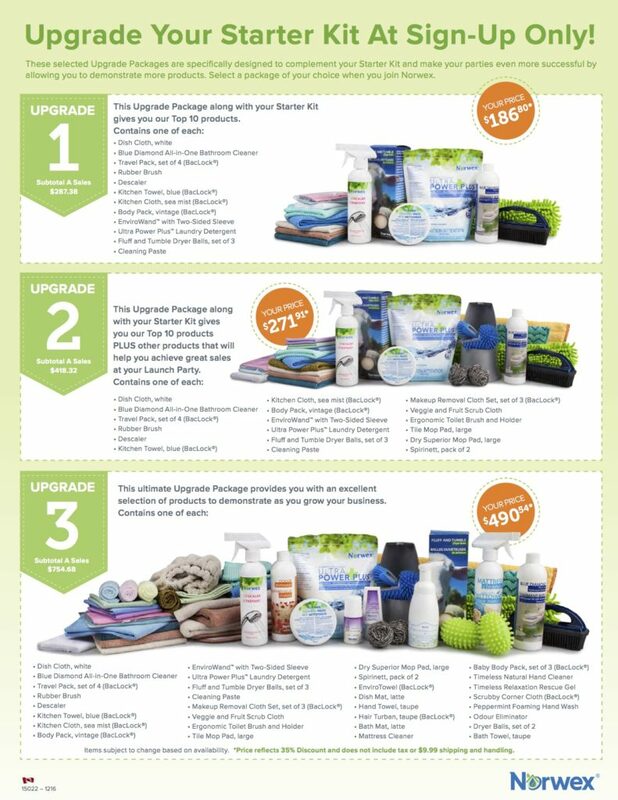 Plus, you will be eligible for the free package of product from the Freshstart (view below)! A great way to start your NEW home-based business. Are you thinking, “What if I want more product to demonstrate?” In my experience, the more product you own to demonstrate, the easier it is to get your business going. At sign up, Norwex offers the opportunity to upgrade your kit. There are 3 great options… Check them out and see what works best for your business plan. Sign Up Tip: When you purchase any of these Upgrade packages, they count towards your Subtotal A Sales and help you achieve your first business goal of selling $2,000 as well as helps you achieve your first FreshSTART step (more information below). The FreshSTART program is another amazing opportunity for new consultants. It is a program designed to get new consultants in the mind frame of setting attainable sales and recruitment goals right from the start of their business. I think it is awesome!! As you reach the each step in the FreshSTART program, Norwex will reward you with more product, each step of the way. There is a BONUS reward when you sign up between November 1 – December 19, 2017 you will receive a FREE Limited Edition grey Chevron Body Towel when you achieve your STEP 1 sales goal. And get this, if you sign up between November 1 – 22, 2017, and achieve your STEP 1 sales goal, you will also receive the matching Limited-Edition Chevron Hand Towel and Body Cloth (all together worth $73). That is a luxurious reward. Take a peek at this video… it explains the why Norwex does what it does and why it is so important. 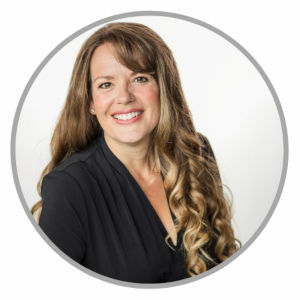 I always like to remind new consultants that “you are in business for yourself, BUT, not by yourself.” By signing up today, you will be joining my team (the Solution Team) that is made up of experienced, done-it-all-before, want-to-share-their-knowledge, helpful, highly-trained consultants. The training and mentoring you will receive will help you on your way. Join my team and start your home-based Norwex business today.